You sweat, you strain, but you might as well not bother because 70 per cent of what you are doing is probably wasted. So says fitness trainer David Marshall, aka the Bodydoctor – and he claims to have all the answers you need. If one thing is guaranteed to leave you more deflated than a punishing hour in the gym, it’s being told that more than two-thirds of your exertion was wasted. David Marshall, the self-styled “Bodydoctor”, says that most of us exercise incorrectly so we are slogging away without reaping the benefits. You need only to be shown the ropes on different gyms to realise how advice varies – assuming that the trainer is not too busy admiring his or her own muscles in the mirror to notice that you are improvising in blissful ignorance. “Who needs to be slim, fit and lovely – you or me? You’re not paying for me to look good,” says David. The gyms answer to the Naked Chef; he strips exercise down to its bare essentials in a six-week programme. If you can afford his personal tuition, you get the obvious benefits of never being left to your own devices. But clients have shown equally impressive results from following his book, which illustrates what to do and cardio exercises and nutritional advice. “It’s the best £40 any gym user could spend,” he says. He would, of course. But if it means no more wasting time and money getting it wrong, he’s right. After six weeks, he says you won’t recognise yourself. The principle is to work with your body as a total entity through heat, repetition and low intensity, rather than forcing it into defense mode by making it cope with the stress of too great a speed or weight. “That’s fine it you want to be a professional athlete or boxer, but most people want to be fitter and healthier with less body fat, a good heart and lungs and low blood pressure. My method makes you stronger, more flexible and structurally better – losing body fat and weight are by-products,” says David – modestly, given that most clients drop at least one or two clothes sizes in that time. He prefers to use this as a measure rather than weight loss because while burning fat properly will make you appear considerably thinner by changing you body shape, your weight may remain roughly the same. Miranda Merton, 33, dropped from a “good size 16” to size 12 by following David’s book. “I have piles of exercise videos and books at home, but this was the easiest to use. Within six weeks, I saw a tremendous difference having lost a lot of fat from my stomach and hips without having to diet,” says Miranda, who used to work out regularly at a health club, but never noticed any improvement. Paul Adams, 27, is 6ft 3ins and 17 stone – having lost four stone since following David’s advice over the past four months. “I’ve lost far more in body fat, though. Scales lie but tape measures don’t. I could never buy cool trousers with a 42in waist, but now I’m a 36 and love clothes shops. My own workouts weren’t making much difference, but David’s method is logical and gets amazing results. However, his method is actually not about pushing yourself to within an inch of your life but about quality rather than quantity. Only later will your muscles remind you that they underwent some unfamiliar contortions. We start with the treadmill, which I had always used as a test of how long and fast you can keep running before collapsing in a heap of sweat. David tells me not to run at all. By taking long walking strides at a suitable speed and incline, you will do more to dislodge the fatty deposits on your thighs, calves and bottom than shocking them into submission with a frantic sprint. Our instinct (often from imitating those around us who are also doing it wrong) is to pound through everything as fast as possible which merely cancels the desired effect, propelling you by momentum rather than muscle power. “Feel my back,” says David while working with two weights to demonstrate the frantic energy spurts most of us exert with a grimace. This will send jolts through your muscles and aggravate old injuries, compared with his smooth and measured movements that develop long, lean swimmer’s muscles rather than short, stocky shotputter’s ones. Given that 60 per cent of muscles improvement is made on releasing the weight to its starting position, not on the initial pull, this half of the action should not be rushed – even though it feels as though you’re doing very little. 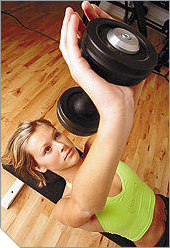 “People work with weights that are too heavy. You have to work with low intensity to burn off fat,” he says. Since most women’s priority is to build up minimal muscle but burn maximum fat, you should therefore work at a weight where 20-25 repetitions leave you exhausted. If you are gasping after four or five, it’s too heavy. Burning body fat explains David, is like heating a lump of lard. Lard – and muscles – need heating up slowly in order for the fat to remain in liquid form so you can dispose of it. Sticking with his cooking analogy, he says that working out is like following a recipe and must be done in the right sequence so one exercise does not cancel out the benefits of another. “You have to work your body systematically, as a unit. Don’t do split routines, such as working on your chest and arms one day and your back and shoulders the next – it will overload that muscle group,” he says. He prefers to use machines as little as possible because they prevent you from building up stabilising muscles in the way that working with free weights on a bench or stretching on a mat do. There is one exercise David pinpoints as the ultimate for women, the side leg lift. You can do it at home and it will have dramatic results. “It’s as good as cosmetic surgery,” he says. “Do it twice a day for a few weeks and you can literally reshape your bottom. “That, alone, is something most women would kill for. Contact Bodydoctor Fitness: 020 7235 2211.